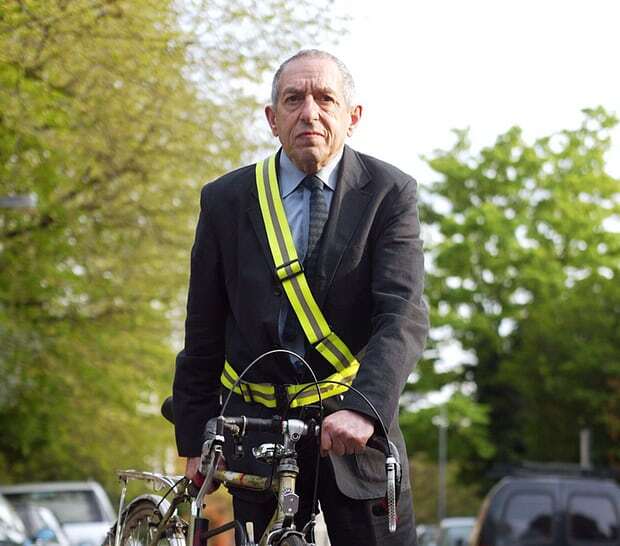 We’re doomed,” says Mayer Hillman. Hillman is an 86-year-old social scientist and senior fellow emeritus of the Policy Studies Institute. 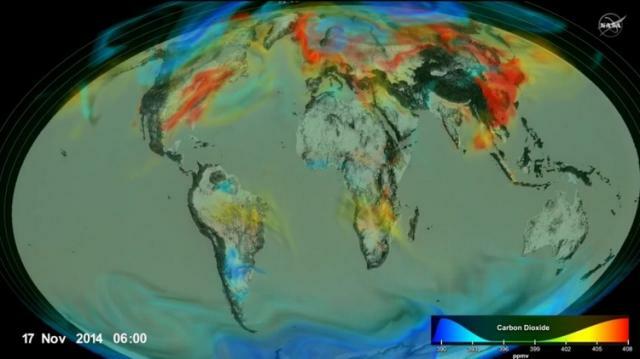 "It’s the end of most life on the planet because we’re so dependent on the burning of fossil fuels. There is no way to reverse the process of the polar ice caps melting." 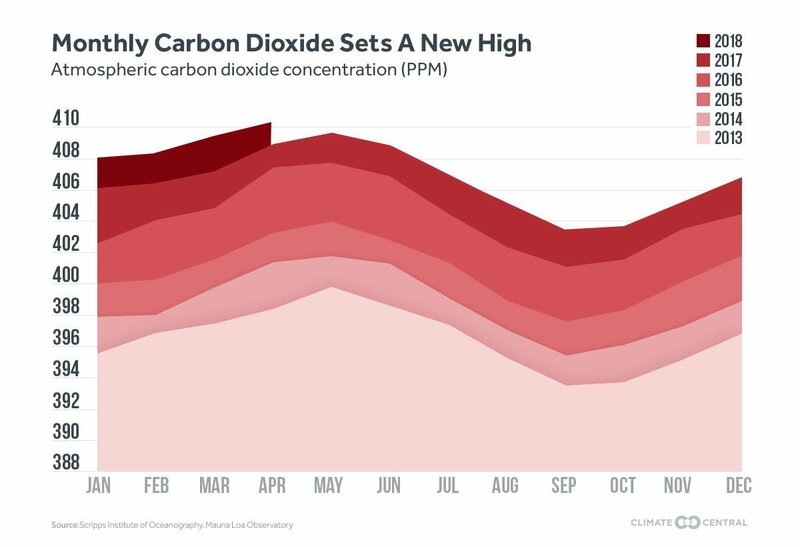 Scientists and climate experts are sounding alarms over atmospheric concentrations of carbon dioxide (CO2) that just surpassed a "troubling" threshold for the first time in human history. 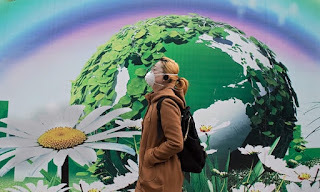 "The reading from the Mauna Loa Observatory in Hawaii finds that concentrations of the climate-warming gas averaged above 410 parts per million [ppm] throughout April," Chris Mooney wrote for the Washington Post. " 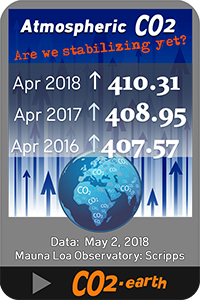 The first time readings crossed 410 at all occurred on April 18, 2017, or just about a year ago. "While the planet's concentrations of carbon dioxide fluctuated between roughly 200 ppm and 280 ppm for hundreds of thousands of centuries, as the NASA chart below details, CO2 concentrations have soared since the start of the industrial revolution—and, without urgent global efforts to significantly alter human activities that produce greenhouse gas emissions, show no sign of letting up. 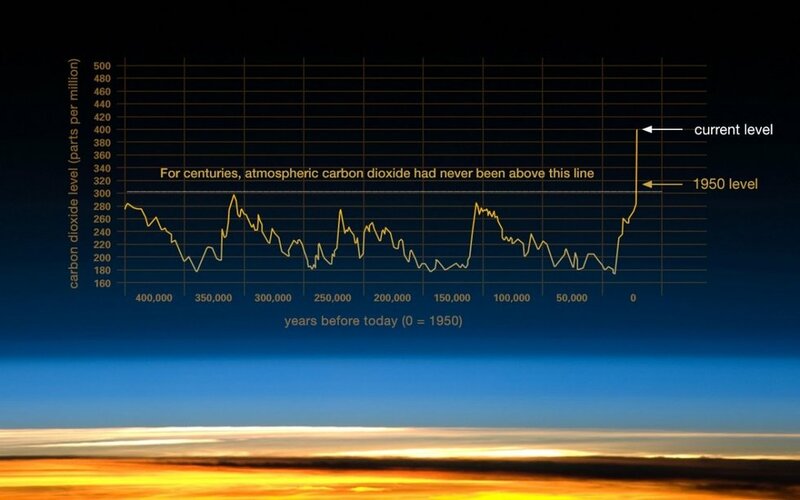 The data is clear; the climate is warming exponentially. The UN Intergovernmental Panel on Climate Change predicts that the world on its current course will warm by 3C by 2100. Recent revised climate modelling suggested a best estimate of 2.8C but scientists struggle to predict the full impact of the feedbacks from future events such as methane being released by the melting of the permafrost. The UK government’s official climate change advisers warned ministers on Thursday that their refusal to ensure new buildings are designed to deal with high temperatures could see annual heat-related deaths more than triple to 7,000 by 2040. Earlier in June, research showed that a third of the world’s population already faces deadly heatwaves as a result of climate change. There is a slight bit of good news. Global emissions of climate-warming carbon dioxide remained static in 2016, a welcome sign that the world is making at least some progress in the battle against global warming by halting the long-term rising trend. All of the world’s biggest emitting nations, except India, saw falling or static carbon emissions due to less coal burning and increasing renewable energy, according to data published by the Netherlands Environmental Assessment Agency (NEAA). However other mainly developing nations, including Indonesia, still have rising rates of CO2 emissions.